I thought this book was about sharing the Christian faith in the ordinary moments and everyday places where we live our lives (sort of like The Coffehouse Gospel by Matthew Paul Turner). I was wrong. But it still seems there's a slight obsession with Christians and Coffeehouses! I drink coffee, but I neither "hang out" at the local java joint, nor call a place that serves coffee a "coffeehouse." In fact, I've NEVER even heard anyone refer to any place as a "coffeehouse." Coffeehouse Theology isn't about evangelism; it's about contextual theology. Ed Cyzewski deserves some credit for the way he unpacks some complicated topics in simple ways. And I'm not using "simple" pejoratively. He really does simplify some ivory-tower concepts into words that most readers (non-academicians) can understand and grapple with. Contextual theology is related to the subject of missiology, in that it's concerned with which Christian practices and beliefs must be practiced by Christians across cultures (to be orthodox) and which are cultural/local expressions of Christianity that can vary from place to place while still claiming orthodoxy. This book helpfully highlights the limitations of living and learning in a certain place at a certain time. Our time and place comprise our culture, which, in turn, influences our interpretation of Scripture and, ultimately, our thoughts about God. The brand of contextual theology presented in Cyzewski's work seeks to avoid the extremes of syncretism on the one hand, and sectarianism on the other (a helpful article on those two poles can be found here). 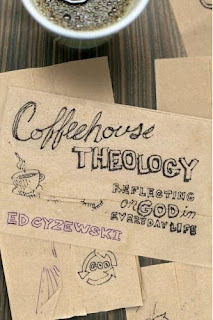 That said, Coffeehouse Theology offers the reader a basic introduction to this version of the theological conversation. The introductory nature of this book is obvious through the "Further Reading" sections at the end of each chapter. Those sections include lists of books that expand on the points he made throughout the chapter. In my opinion, he should have included a brief summary of the books included in those lists; it's not likely that the typical popular-level reader will have either familiarity with those works, or the ability/desire to go out and purchase them for "further reading." What I appreciate most about this book is the author's insistence that both theology and culture matter. This is a healthy corrective for people and churches who emphasize one at the expense of the other. On the whole, this book isn't great but it's a decent introduction to the ways that culture and theology intersect and shape each other.